The Tidemaster, located in the heart of the Ocean Drive section of N. Myrtle Beach is a luxurious nine story concrete & steel high rise oceanfront resort. The Tidemaster offers a large oceanfront pool, kiddie pool, outdoor showers, a grilling area, 2 Twin High Speed Glass Elevators, a secured lobby and a large overflow parking lot. Our 5th floor corner unit (#506) has a wonderful floor plan. WiFi wireless internet service is included for free with all rentals. This condo has about 1500 square feet of floor space. The living room overlooks the ocean and has upgraded sliding glass doors that open to a private oceanfront balcony. The balcony is also furnished with chairs & a chaise lounge, so that you can relax and enjoy the view. This condominium is the owners second home. It has been totally renovated and is tastefully decorated. The living area has a wonderful view of the ocean, as well as a great view from the master bedroom. Both the master bedroom and the living room have access to the private oceanfront balcony (new upgraded sliding glass doors ). The master bedroom has a new King size bed, and the second bedroom is furnished with a new King-size bed and Third bedroom with two new Queen size beds. All bedrooms have Flat Panel TV's, ceiling fans and new carpet. The Master Bedroom has a 50 inch Flat Screen TV. The spacious living room and dining room flow well together. The living room has new (2017) recessed lighting and a ceiling fan for added lighting and comfort.The dining room has a table for six and the breakfast bar seats four. The kitchen has all new raised panel cherry cabinets and granite counter tops. The entire unit except the bedrooms have new tile floors. The bathrooms have new vanity's and granite top surfaces. This is a well maintained unit and one that has alot of space. Plan ahead now for that vacation, and make your reservations early. My name is Tommy Sides and I am owner of this condo. Our family and friends have enjoyed N. Myrtle Beach and the laid back life style it has to offer for years, and we hope that you will enjoy it also. We want to share our beach home with you and look forward to serving you. This property and these condos are in the ideal location. The condos are a very nice size with each bedroom being almost as large as the master bedroom which is a rare find, and each has its own full bathroom. Low density with only 54 units in the building with 2 high speed elevators. 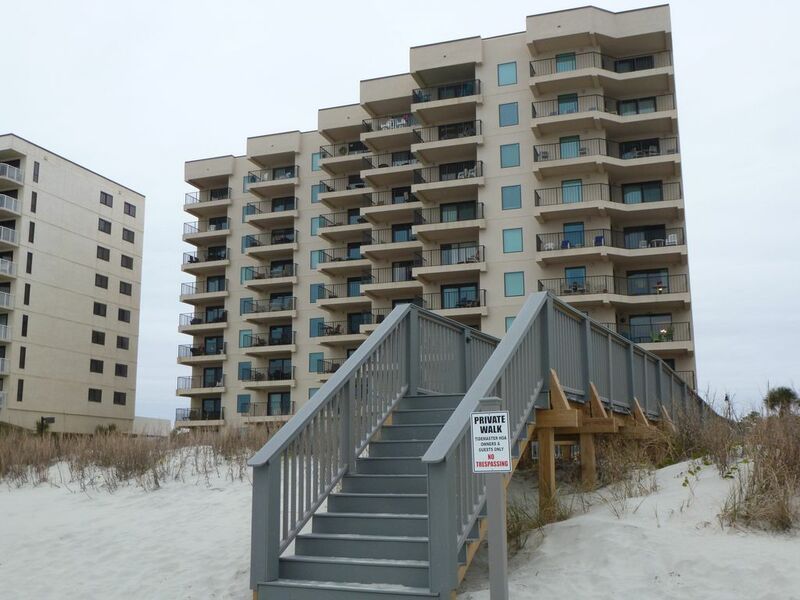 The beach in front of our building is not overly crowded and the access back and forth to the condo is easy. Location, Location, Location. Main St and all of it's activities are just a short walk away. You will enjoy staying at this location. This condo is within walking distance of Main St in Ocean Drive. The location is perfect. Close to all Shagging Events, parades, and local events. Main St has amusement rides for the kids during the high season. toilet, combination tub/shower, Updated Master Bathroom-Private in room Bath. toilet, combination tub/shower, Updated Hallway & Center Bedroom Bath. toilet, shower, Updated Full Bathroom with walk-in shower. Each bathroom has been updated with new cabinets, sinks, faucets and granite counter tops. This property is Waterfront. All condos have a view of the Beach & Ocean. A/C system was replaced 2015. Ceiling fans in all rooms for additional comfort. Heating system was replaced in 2015. LINEN SERVICE IS OPTIONAL AND COST $30 PER BED FOR THE ENTIRE STAY. We have a large capacity washer and dryer inside the condo. We have a washer and dryer inside the condo. Parking at the front of building with additional parking across the street. Free Wireless Internet provided by Contract Data for our guest. Large Living room with 42 inch Flat screen TV & Direct Oceanfront Balcony Access. Living area offers a Couch, Love Seat & Chair. We have recently added recessed lightning and a ceiling fan. Stainless Steel Refrigerator with built in ice maker. Over range Stainless Steel Microwave. The Kitchen is well stocked with Dishes, Silverware, Glassware and more. Large Fully equipped Kitchen with Dishwasher, Stove, Microwave, & Refrigerator. The dining room table seats 6 and the bar seats 4. Plenty of room for dining and entertaining. This condo has a total of 4 Flat Screen TV's. CABLE SERVICE PROVIDED BY SPECTRUM COMMUNICATIONS. THIS CONDO HAS A STEREO SYSTEM AND CD PLAYER. THIS CONDO HAS 4 DVD PLAYERS. Balcony overlooks ocean. Our balcony has a chairs and a chaise lounger. Great view. Pool deck overlooking the ocean with plenty of comfortable lounge chairs. Public courts are 5 Blocks away at the MC LEAN City Park. Many golf courses are close by. Many within a 5 min drive. Large oceanfront pool with great view of the beach. Our pool is 8 foot deep. For smaller children, we have a Kiddie Pool. We just returned from our stay at this condo. With Hurricane Michael hitting Myrtle Beach a week before our planned vacation we were VERY worried. However, no damage that we could see to this area. The condo is beautiful and very well decorated. We have rented from Tommy before and were very happy with our units. I only had one suggestion.... since there was four of us the balcony seating is only for 3. A table and 4 chairs would have been nice since we like to enjoy a cocktail and play cards on the balcony in the afternoon. But we were very happy with the condo and hope to return again. Thank you Tommy for a great vacation. We had a wonderful Family Vacation at the Tidemaster. The unit was beautiful and had everything we needed. We have also always liked that this building is a smaller building, making it much quieter and the elevator wait shorter. This was an end unit and the views were absolutely beautiful. The owner, Tommy Sides, was very kind and easy to work with. The proximity to Main Street is something we have always enjoyed when staying at this Condo complex. It's a very easy walk and the shops, restaurants and Ice cream are great!!!! Susan, thank you for staying with. We are pleased that you were happy with the condo and it location. This complex is in a great location and the condos are just the perfect size. We look forward to serving you and your family again. My family and I first visit to North Myrtle Beach was awesome. This condo is great, everything they said it would be. The owner Tommy Sides is great to work with, he made the renting process of this condo easy. It was relaxing sitting on the balcony looking over the ocean. The condo has everything you need to dine with and plenty of room. The only thing I recommend is for Tommy to get a new guest book for everybody to sign because I used the last page lol. Thank you Tommy for a great condo, can't wait to come back!!!!! My family and I have been visiting North Myrtle for several years now. Finding a place to stay is one of the biggest challenges I have to overcome. This condo was excellent! It wasn't just the Condo, Tommy was great to work with. I will stay at any property that he owns. The kitchen was beautiful, and there was enough room for everyone. Thank you for all of your help and a wonderful place to stay. We will be back!! Great place to stay. Clean, spacious, kitchen stocked well if you want to cook in. Just a short walk to all the dance clubs in North Myrtle Beach. Can't say enough good things about this place. Hope to stay here several times each year. Gary & Denise, thank you for staying with us. We look forward to seeing you again in the fall.